The Research Center for Leadership in Action builds knowledge and capacity for leadership to transform society. Housed at New York University’s Robert F. Wagner Graduate School of Public Service, a nationally top-ranked school for public service, the Center’s unique approach integrates research with practice, bridges individual pursuits and collective endeavors, and connects local efforts with global trends. 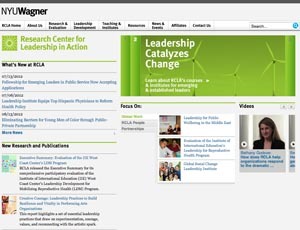 RCLA scholars use innovative research methodologies to advance big ideas in leadership, and the Center’s customized leadership development and capacity-building programs facilitate critical reflection, peer-to-peer learning and transformation at the individual, organizational and systems levels.